Yes! Croissant is one of my favorite breakfast. When we were in Thailand I always devour this meal because it's not only cheap but also very delicious. Croissants are made of a leavened variant of puff pastry. The yeast dough is layered with butter, rolled and folded several times in succession, then rolled into a sheet, a technique called laminating. Crescent-shaped food breads have been made since the Middle Ages, and crescent-shaped cakes (imitating the often-worshiped Moon) possibly since classical times, The croissant in its current form was invented in Vienna after the victory of the Holy League against the Turks in 1683. Croissants have long been a staple of French bakeries and pâtisseries. In the late 1970s, the development of factory-made, frozen, pre-formed but unbaked dough made them into a fast food which can be freshly baked by unskilled labor. Indeed, the croissanterie was explicitly a French response to American-style fast food,and today 30–40% of the croissants sold in French bakeries and patisseries are frozen. This innovation, along with the croissant's versatility and distinctive shape, has made it the best-known type of French pastry in much of the world. Today, the croissant remains popular in a continental breakfast. Luckily, I again had a chance to eat my favorite croissant at the Unilever's event. 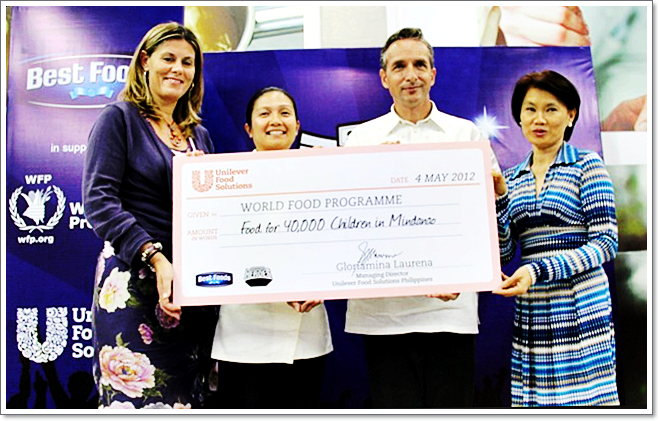 Unilever donated Php 400,000 to the United Nation's World Food Program. See entry here. Php 400,000 means food to 40,000 children in Mindanao. You see each and everyone of us should realize how lucky we were. We don't have to beg for food or shelter. Anyway, back to my favorite Croissant. At the registration table of Unilever they asked us to filled up a form as to what type of bread do we like, they further instructed us to indicate toppings and other ingredients and ornaments that we like in our sandwich. I put croissant as my bread of choice with ham, cheese, tomato, lettuce, catsup and mayonnaise. They then asked us to pick one paper from the fish bowl. We had to prepare a sandwich for the name indicated on the paper. A gentleman journalist prepared my sandwich. I, on the other had prepared the preferred sandwich of a Manila Times reporter. It was fun, because we get to meet other participants in the event and we had so much fun posing for photos when we presented the sandwich to our lucky pick. I am so happy :-) I love Croissant! I love croissants, too. I have baked a few of them. making croissants takes patience and a whole lot of practice but it does pay off in the end. Croissants with ham, cheese, tomato, lettuce, catsup and mayonnaise is a good combo. I also love adding crispy bacon strips to it :) Yum! That croissant looks yummy. The participants making sandwiches for one another was a good way to break the ice and interact. one of my favorite is croissant. sarap especially if it is buttery. hot coffe lang,solve na ko. I do love croissants! And I did stumble on this pastry shop at Makati that serves good pain au chocolat (chocolate croissant) It's flaky and nice.